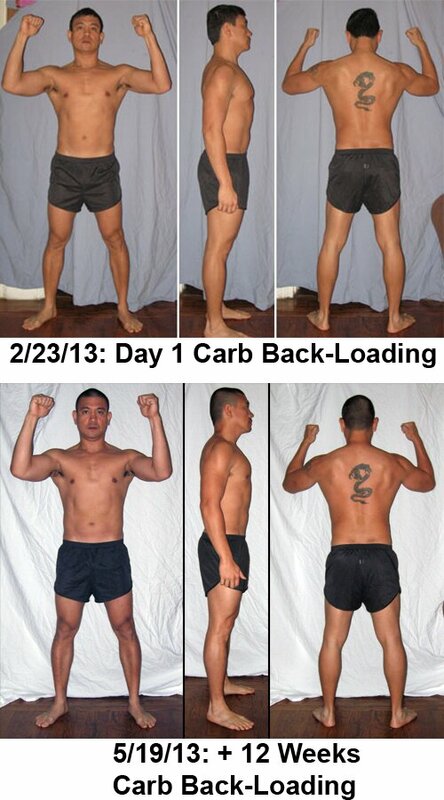 +12 Weeks Carb Back-Loading Review (2/23/13 – 5/19/13) – My Journey to Godliness! It’s finally been 12 weeks since I started my adventure in Carb Back-Loading (CBL). Learned much from my time doing a Paleo Diet and doing LeanGains. Both are done while doing 5/3/1 program and the same with CBL. While I lost both weight and body fat doing Paleo and Leangains, I made a slightly different goal while doing CBL. I noticed that while I was getting very lean with Leangains, I was also losing some Lean Body Mass (LBM). I am guessing that I may not have been eating enough protein and could have prevented that. Goal while doing Carb Back-loading was to lose or at least maintain a low body fat while gaining some lean body mass back! It looks like I achieved my goal considering I gained approximately 6 lbs of LBM and dropped my body fat by 1.1%! It is somewhat hard to tell by the progress pic but the measurements show some small changes. Slowly filling up in parts while leaning out in other areas. I know I could probably had better results but I had a few obstacles that was in my way. First of them is the fact that my schedule makes it hard to optimize Carb Back-Loading. Working night shift already can cause many issues with my body so I had to tweak things around to make the program work for me. Also had a few times my meals was not proper and slowed down my progress. In the end of the 12 weeks, progress is still progress! I feel that I still have much to learn and will continue my adventure in Carb Back-Loading for a little while longer. I am confident that with a few more tweaks I can make Carb Back-Loading work better for me even with my less than optimal schedule! In my journey to achieve a better me, I have learned much about myself and how my body works from trying out Paleo, LeanGains and now with Carb Back-Loading.